Place peeled and cubed sweet potato in a pot with water. Bring to boil and cook until done. Err on the side of cooking too long and being “over done” as opposed to “under done”. Pour sweet potatoes into a colander to drain the water. Add coconut oil to now empty pot and heat over medium-low until melted. Place sweet potatoes back into pot with coconut oil. Add cayenne pepper, paprika, and black pepper. 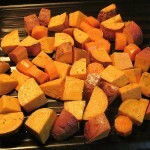 Toss over low heat until the sweet potatoes are well coated with all other ingredients. Remove from pot and serve warm. Goes great with bacon and eggs or just about any other protein source.